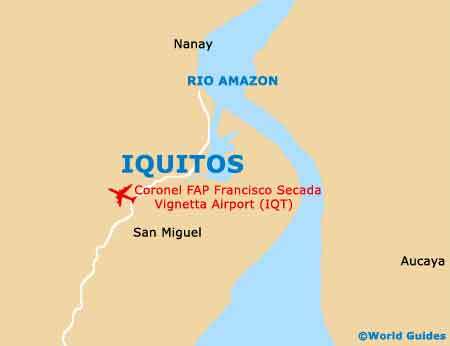 The Coronel FAP Francisco Secada Vignetta International Airport is the main air gateway for those wanting to visit the Amazon rainforest. Located just a short drive from the city of Iquitos and right in the centre of the Peruvian rainforest, on the Amazon River, this part of Peru is a popular place from which to explore this natural wonder. The airport of Iquitos is presently looking to add more international flights, since connections to Brazil and the US have been suspended. The Copa Airlines flight to Panama City has therefore been somewhat elevated in status, becoming an important international route. The airport services a range of scheduled, chartered and private flights, connecting most parts of the Amazon and beyond. The main airlines flying in and out of this airport are Copa Airlines, LAN Peru, Peruvian Airlines and Star Peru. Primary destinations served are Lima, Pucallpa and also Tarapoto (the 'City of Palms'), while seasonal flights run to Panama City. The Coronel FAP Francisco Secada Vignetta International Airport is located approximately 7 km / 4 miles to the south-west of Iquitos, being close to Santa Clara, Santo Tomas, San Juan Bautista and the Reserva de Quistococha. Unlike other regional air hubs, this airport is open 24 hours. Additionally, it is easily accessible from the city centre of Iquitos. The airport is located just south-west of Iquitos city centre and offers convenient access by car. The Jose Abelardo Quinones road from the airport leads straight into the city centre and the drive takes less than 15 minutes. From the terminal, it is also easy to access the famous Pacaya-Samiria National Reserve rainforest, which is located about 18 km / 11 miles to the south-west. Alternatively, the Reserva Nacional Allpahuayo-Mishana is somewhat closer. Book your Iquitos Car Rental here. Taxis are the easiest and cheapest way to reach the heart of Iquitos. A number of taxis are on hand right outside of the terminal building and services are offered by licensed taxi companies Taxi Fono, Taxi Flores and Taxi Apto. There are also so-called mototaxis, or auto rickshaws.